On May 16, 2014, the Possum Kingdom Lake Association (PKLA) published it's White Paper as presented to the Board of Directors of the PKLA in support of OPPOSITION to BRA's past, current and future management protocol for RELEASING WATER FROM Possum Kingdom Lake to balance water levels between PK and Lake Granbury. The conclusion of the White Paper strongly suggests that PKLA should request that the Brazos River Authority immediately cease and desist releases from PK Lake in an attempt to balance water levels between PK and Granbury. Subsequent to the release of this White Paper, the PK Lake Association adopted a Resolution formally requesting the BRA cease and desist the release of Possum Kingdom Lake water to Lake Granbury for balancing purposes. To quote from that resolution, "It is PKLA's position that balancing lake levels between Possum Kingdom and Lake Granbury does not provide for the greatest practicable measure of conservation and beneficial utilization of the water stored in PK, and, therefore, the BRA MUST NOT continue balancing protocols." Commissioner's Court Resolution dated May 16, 2014. Further, the Stephens County Commissioners Court also met on Monday, May 12, 2014 and passed the exact same resolution. A meeting with Young County Commissioners is set for later this month at which time they are reported to be considering adopting the same resolution. As a party with interest in Possum Kingdom Lake, please download the Resolutions and make your State Representatives and Senators aware of these actions and ask for their support. 1) ARE YOU A MEMBER OF THE PK LAKE ASSOCIATION? If not, please click here to download the Membership Application. 2) PLEASE ALSO CONSIDER DONATING TO THE PROPERTY PROTECTION PLAN - The Association uses your donation to help fund the looming legal fight against the BRA's Water Application 5851 currently being considered by the Texas Commission on Environmental Quality (TCEQ). Additional expenses may also be incurred with this latest development in fighting Lake Granbury's request to reevaluate the current balancing protocol in order to increase the amount of water released from Possum Kingdom Lake. 3) ATTEND THE PK LAKE ASSOCIATION ANNUAL MEETING - June 7, 2014 at 9 am - Meeting is will be held at the PK Chamber of Commerce at 362 N. FM 2353, Possum Kingdom Lake. For your reference, using information provided by the Brazos River Authority, Pondera has created the following graphic illustrating the history of lake levels at PK. 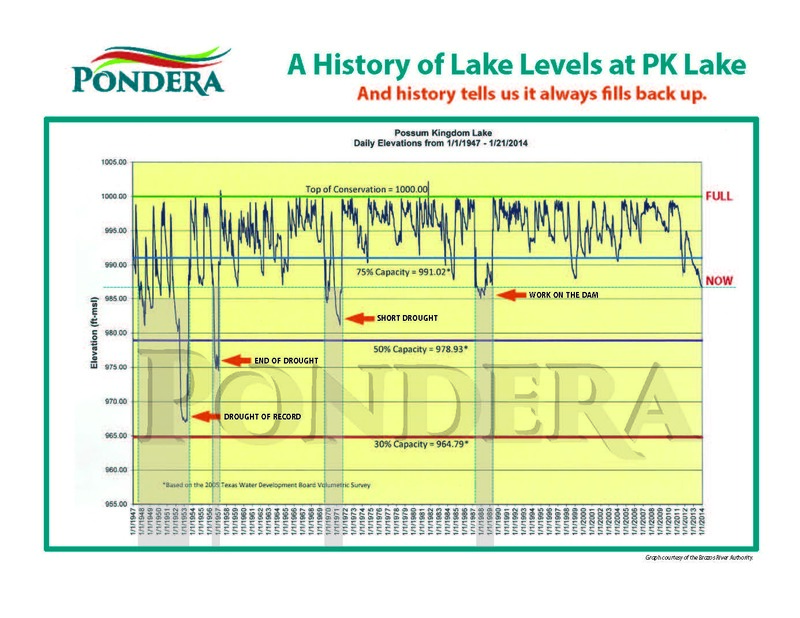 If you would like a printable copy, please contact Pondera by sending an email to lakelevels@ponderapk.com, and we will forward a PDF of the document to you.